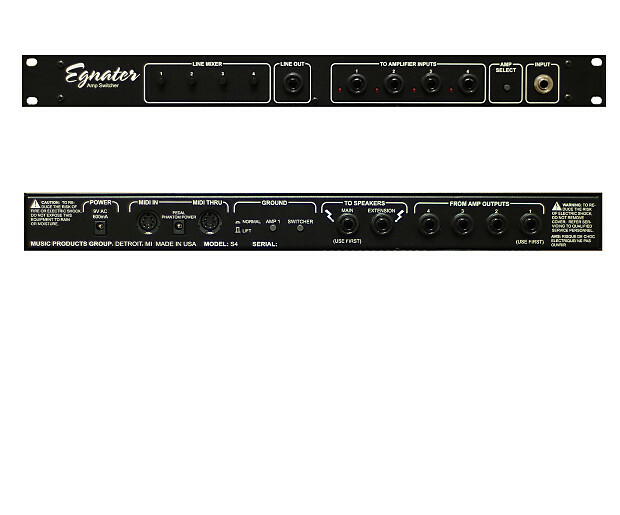 The Egnater SS4 is a custom made midi compatible amplifier head switcher that was built exclusively by Bruce Egnater for Ultra Sound Studios and Ultra Sound Amp Sales. 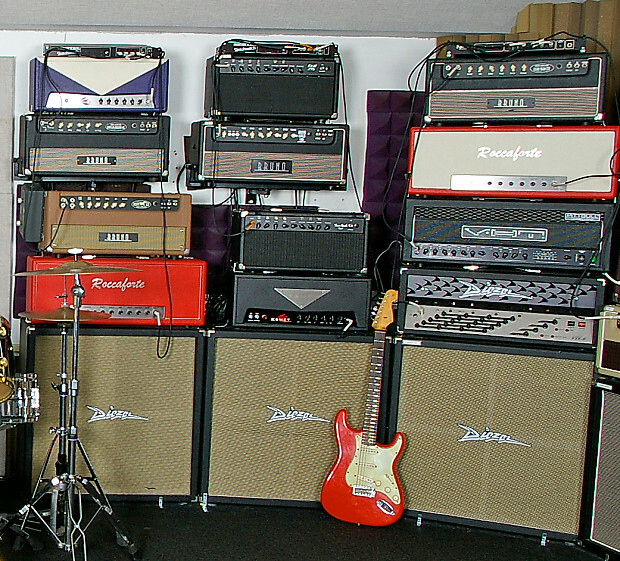 The SS4 allows the user to select any one amp head from up to 4 amp heads connected which play through one or two speaker cabs. The SS4 allows any one head to be switched in and used at a time and a load is placed on the other amps that are switched out so it is totally safe to have all 4 amps running at once. The unit has built in hum prevention circuitry and ground lift switches for quiet operation of all amps. It can be controlled by any midi control pedal and is programmable. There is also a courtesy button on the front panel to switch between amps. Switching is silent and instant and the SS4 can be used to build your own multi amp setup for Live or Recording so you can use one amp for clean and another amp for gain and another for lead and switch between them with a midi foot pedal. It works just like a multi channel amp except you can use the finest vintage or boutique single channels amps to build the ultimate 4 channel / 4 amp setup. It also has a universal line out with separate send volume controls for each amp so you can balance the output of each amp. 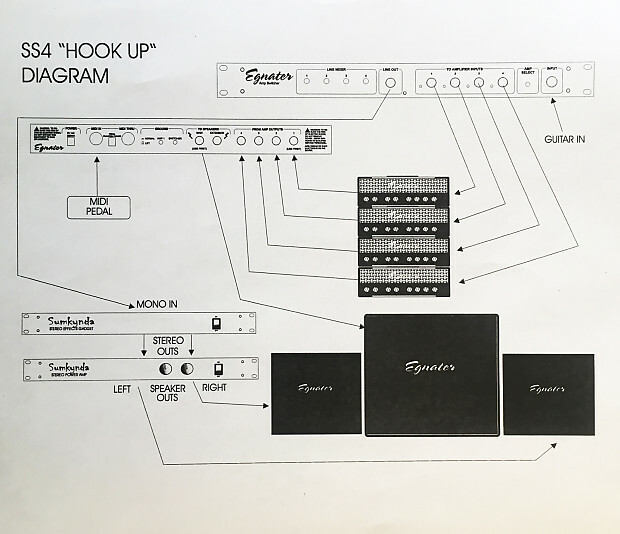 All line outs are summed to the output so if you switch amps whatever amp is switched in goes to the line out automatically. Great for wet dry setup or direct recording. We have used more than 40 SS4 switchers here at Ultra Sound in most of our studios for the past 10 years and they are exceptionally reliable even with heavy usage. The Egnater SS4 switcher is used by several top artists for their live rigs and is also the amp head switcher installed by some of the finest and most well known rack builders who build rigs for these stars. The SS4 is a one rack space unit. I will ship via Fedex Ground or Home Delivery with tracking to the Continental United States . To negotiate shipping rates to other countries or areas, please send me a message. Ultra Sound only accepts returns for cash refunds if the item is not functioning correctly when received by the buyer. For all other returns the buyer will be issued a store credit minus a 10% restocking fee. The buyer may use this store credit at Ultra Sound for amps, cabinet, speakers, tubes, or anything else we sell.